Four things which I have a great deal of passion for are mountains, fall leaves, architecture and churches and when you can get a good dose of all four at the same time, its like getting a big bonus. Mountains are in my blood, no doubt handed down from the many ancestors that settled in that part of North Georgia where the hilly, rolling land meets the sharp rises of the Blue Ridge Mountains. To me, there is no prettier place than the mountains in autumn when the leaves are at the peak of color. I have always felt closer to God there, almost as if the high mountain places can bring you just a little closer to him and give you a bit of the perspective from his point of view. Churches are a large part of the mountain regions that make up such a large swath of Georgia, Tennessee, North Carolina, Kentucky and Virginia and no town I’ve found, large or small, goes without a wide variety of architectural styles as well as religious faiths. A common characteristic of mountain churches is that many of them were constructed by their original congregations on the very tops of hills, often with a spectacular view of the surrounding area and being surrounded by nature, they become one with it. Our annual BMW Z Roadster drive through the areas surrounding Maggie Valley, North Carolina has brought me back for the sixth year in a row and with a little extra time at my disposal, I headed into neighboring Waynesville to see a church I had spotted previously and wanted to see again. Grace Episcopal Church in the Mountains sits upon a promontory overlooking much of the surrounding historical town of Waynesville. While many of the buildings in the area are older, early 20th century structures, Grace is a classic example of midcentury modern architecture, heavily influenced by the style of Frank Lloyd Wright. Wright, who was still living when the present church was constructed in 1957, was the most famous architect of his time and many of the buildings constructed at this time when his career was at a pinnacle reflect his genius. 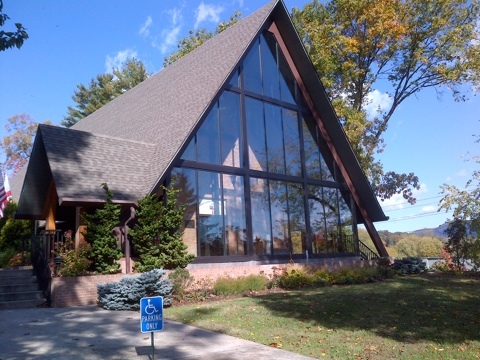 The main sanctuary building was designed in an “A frame” style with a tall peaked roof that sloped all the way to the ground and constructed on what appeared to be large steel trusses. What attracted me to it in the first place was the large glass narthex (church speak for lobby) that made up the entire front of the building with its clear windows that poured sunlight into the large, airy room. I found to my dismay that the church was locked but as luck would have it, we ran into a man named David Crocker who identified himself as the Junior Warden of the church. We asked him if we could see the inside of the sanctuary and he graciously obliged, leading us down the hall into the spacious inner sanctum of the church. If the outside of the church was sleek and modern, the inside was an elegant, inspiring blend of both the modern and the traditional. 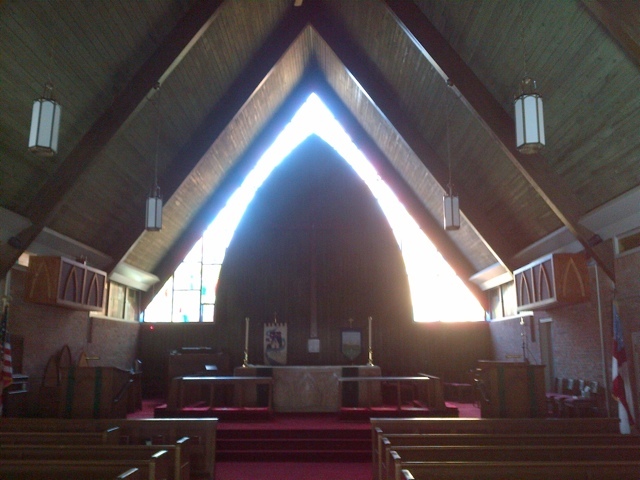 Being a United Methodist, which has roots in the Episcopal church, I immediately felt right at home among the fixtures, noting the familiar arrangements of the altar, the hand embroidered kneeling cushions and the green vestments of the Season after Pentecost. The soaring ceiling of wood planks was supported by enormous wooden arches and behind the altar, a modern style stained glass window rose from the floor to the top of the sanctuary, providing the perfect backdrop and seemingly pointing the way upward. In a way, it reminded me of the Greek letter Alpha, which is also associated with God as the beginning of all things. Through the stain glass, I could make out the colors of fall trees beyond and I only wish my photograph could have done the scene justice. As we moved down the center aisle toward the narthex and entered it from the sanctuary, I was stunned by the beauty of this room constructed of glass and wood with its stacked brick back wall. The view was spectacular, a picture of fall colors, town buildings, blue skies and warm sunlight pouring in. This was a stained glass window always in motion, always changing from one minute to the next so that each person that sees the panoramic vistas ahead would be treated to a view that was unique to them. I could imagine this very scene on a clear sunny day with a blanket of winter snow on the ground or even on a gray day with fog descending on the tops of the mountains beyond town, or on the warmer, early days of spring when the trees in the yard would be in full bloom. This room and this view was a tribute to the Creator and an excellent way to observe his unending work on the earth around us. Many times when I work on a project, it is never completely done because I will come back and tweak or tinker with it. With me, everything is always a work in progress and so it is with God as well-it has been, and always will be a work in progress. Churches no doubt were placed on high points in mountain towns to remind the faithful where they needed to be on Sunday mornings and to send a message to all that God can be found in high places. Of course, those of us who believe know he can be found anywhere but I think there is a symbolism in meeting for worship in a high place set apart from the ordinary, everyday places of the surrounding towns and countryside. Maybe the truth is that it was easier to get a church member to donate a piece of land that was not very suitable for farming as a place to build a church but in the end, whatever the motivation, I think it worked out for the better just the same. In this case, a group of churchgoers took it upon themselves to construct a church that not only blended well with its natural surroundings but that also rewards those who worship there with a spectacular example of God’s work the moment they exit the sanctuary…and a moment to lift up their own eyes unto the hills from which they can draw their strength as the go out into the world. I see the Wright influence on this building very clearly as well. I notice the alpha-image on the two speakers (I’m guessing), that just out from the wall on each side facing each other – nice touch. That back window is really something, with the central shape pointing to the peak of the roof and the sky beyond. Very nice space – thanks for sharing it with us. It was a very special place to visit and obviously well cared for by its members. Wright’s influence is strongly felt.